Zona Fountains Carries a Vast Variety of Products! Pots in Just About Every Shape & Color! Zona Fountains Inc. is Tucson’s largest fountain and garden décor store, offering an extensive selection of yard art and accessories for your yard or patio. 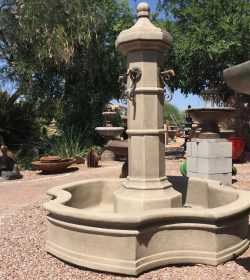 With over 150 fountains in stock, as well as hundreds of items such as birdbaths, benches, table sets, metal cactus, Mexican pottery, concrete pots, concrete planters, and more, we offer the best selection in Southern Arizona. With roots reaching back to 1992, we have assisted thousands of satisfied customers to enhance the exterior of their homes and gardens. We offer products from American Manufacturers as well as manufacturing a variety of items locally. We are Tucson owned and managed and our professional staff is knowledgeable and ready to assist you.